A rugged, glaciated, and rarely visited peak near the eastern boundary of Garibaldi Provincial Park on the divide between Tuwasus and Billygoat creeks. Access is via the logging roads that run up to the park boundary between Tuwasus Creek and Billygoat Creek. Follow a northeast pointing branch of the Tuwasus-Billygoat divide to the glacier east of Nivalis Mountain. 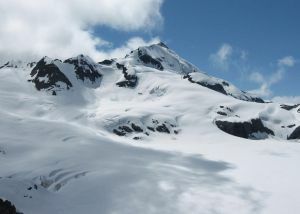 Perform a high-elevation clockwise curl of of this peak and ascend the easy, glaciated west slopes to reach the summit.